In the world of weddings “budgeting” is a dirty word. However, in reality budgeting should be an important part of your wedding plans. The first question you should ask yourself, and usually its the last one you want to, is “how am I going to pay for this?” Some people may scoff, but your wedding is not about spending every last penny you have to your name in order to impress the next door neighbours. Your wedding is about you and your partner becoming a legal partnership as a result of your love for them. It shouldn’t matter if you get married in a hole or a castle (but obviously it does!). Having your perfect day is do-able (within reason), you just have to be savvy with your money, because unfortunately, money doesn’t grow on trees. 1. 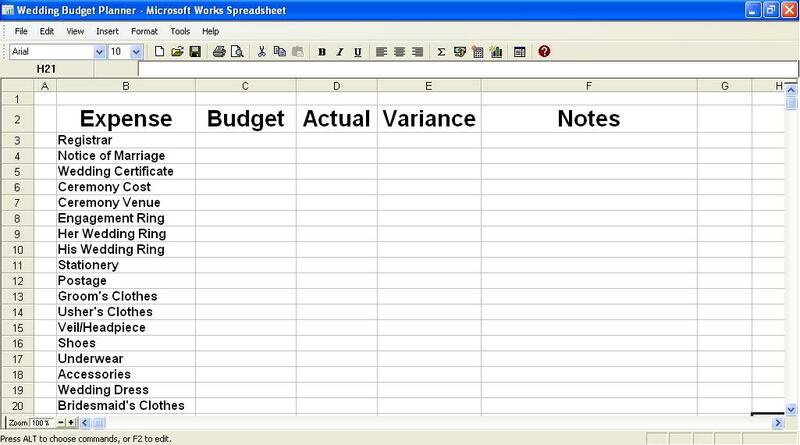 My all time top tip is, set up a budget spreadsheet on Excel (or similar). This will prove invaluable if you have a tight budget. It is amazing how the odd £10 here and there adds up, and remember, there are bills to pay at the end of the day. I’d also suggest printing this off monthly, just in case your computer dies and you loose your data. By having a monthly copy you can easily backtrack and add things on. 2. Research. Comparing different companies, venues, products and services is the key to sticking to your budget. Create a spreadsheet in order for you to compare the above against set criteria that you feel is important. Venues that are within your budget and tick all the right boxes will be easily identified if you use of of these. 3. Use Your Voice. I’m not talking about singing, shouting or swearing, but use your voice to get what you want. Demanding this, that and the other will not work when neotiating a price for something, but state your budget, stick to it and ask what deals suppliers can do for you. Yes its a little embarrassing to say “I only have £500 and I need all this stuff”, but by being honest and upfront you are more likely to get you a better deal. 4. Use and Abuse Your Family (not literally!!!) Before you start spending money on cakes, stationery, flowers, rings etc, get together with your family and see if you can identify anyone who has a particular talent. Your Granny for example may be an amazing baker, and would jump at the chance of making your wedding cake. Your Auntie may be a florist – use their talents to limit the amount of companies you have to employ! Please note that this is not the opportunity to ask family members to pay for things to be bought from a company! You are simply using their talent to create something a bit cheaper! Plus it is nice to have the family involved in your big day. There are many ways where you can save money whilst planning your wedding, and often you can save the most by compromising on the bigger expenditures. 1. Consider seasons. May-September is prime time for wedding venues (the pictures look lovely), and as a result of that they hike their prices up a few extra thousand, just because they can. By considering October-April weddings, you could save yourself a packet! Mr M and I are getting married in December; simply because its cheaper!! 2. Weekday or Weekend? Weekdays are often a lot cheaper than the popular Saturday or a Sunday before a bank holiday, because they are less convenient with guests and couples don’t want to risk having a poor show of guests because they can’t get out of work etc. Some venues even offer their building for free during the weekdays! So if you could work around having a weekday wedding, send out save the date cards a bit earlier so your guests have time to book time off. 3. Food. Catering is often the biggest expense of a wedding. Some top venues charge a whopping £75 per head for a 4 course meal, which could add up to £7500 if you had 100 guests!! And that doesn’t include the hire of the venue itself!!! In the low wedding season particularly, try and liase with your wedding co-ordinator to get some freebies. For example, for every 5 bottles of champagne bought, a bottle of sparkling wine is thrown in for free. If they are experiencing low take up numbers they may be inclined to let you have it to make some money! 4. Wedding Dresses. When it comes to wedding dresses, a bride wants the best. Before the lady in the shop guides you to the rail of new season dresses, ask for the sale rail. You are no means being “cheap” by buying a cheaper dress. If once the sale rails have been exhausted and still no luck, then state a budget to the shop assistant do not let her show you a dress one penny over. Once she’s got you up an extra penny she’s got you up an extra hundred pounds! 5. Stationery. You will notice a lot of focus on DIY stationery on this blog. Simply because it is one of the easiest ways to save a couple of hundred pounds. All that is needed is a bit of time. For example. Save the date cards, rarely come in at less than a £1, day invites rarely less than £2.50, and evening invites are rarely any less than £2 per guest. For 100 guests, 50 day and 50 evening, that works out at approximately£325.00, not including the extras you may want in case of mistakes. Or name place cards, or table plans, or thank you cards for that matter… So why not make your own? I have bought enough card and ribbon to make save the date cards, day and evening invitation plus thank you cards for 100 people. All to the cost of approximately £40!!!!! Well, in fact outline two budgets. This is the very first thing you should do when you start to plan your wedding. The first budget should be your total-I-have-not-a-penny-more-to-spend budget. As the name of it suggests, this is your total upper limit of money you have to spend on your wedding. The second budget, should be the one you’d ideally like to spend. For example, you have a maximum of £8000. However, you’d like to save £1500 really, so you could paint the kitchen. But if you did go to £8000, it’d be fine as bills would still be paid and the kitchen could wait another year. Your budget should NEVER include money that should be paying the bills. A giant balloon arch would look nice, but you’d probably also like to have electricity for the next month..
Set your budget realistically! Weddings can be expensive, and little bits and bobs all add up! By creating your guest list early on you can have an idea of the capacity you need to cater for when it comes to fitting people into a venue. Firstly make a list that includes everyone you’d want to invite if possible. Then make a second list, that has the most important and vital people that you would ever wish to attend your wedding. Bet you cut the first list by at least 40%. Unfortunately, guests mean money. Your mother’s best friend’s sister may have changed your nappy when you were two, but unless she has been a consistent figure in your adult life, you could probably put her on the evening list. It’s been painful for me and Mr M (especially as he has about a million family members), but if you are on a tight budget, the people that should be attending the most restricted part of the day which is often the ceremony itself should be those who you could not imagine being anywhere else. Be realistic. If you have a budget of £4000, you aren’t going to be able to have an exclusive castle wedding (unless you own the castle itself). Consider things a little out of the box. Local village halls, or community halls don’t immediately spring to mind, but often they are able to give civil ceremonies. Often these venues can be described as what I call, “a granny’s nightdress” – old fashioned and a bit worn out, but with some well planned decoration, a gorgeous wedding can be created. This is often the case with churches, particularly rural ones. The church for the ceremony can be quite cheap, and they often have grounds surrounding them (not the grave yard), which could hold a marquee reception. In my opinion, photography is one of the most important purchases for your wedding along with entertainment. Photos hold memories from your special day and these will be very important once you have children/grandchildren etc. (Also when you have the “wedding blues”!) Wedding photography packages are very expensive however and will take up a large chunk of your budget. By looking into amateur photographers from local colleges and universities, you can save a fortune. If you decide you really want to have professional photographers there, choose a two hour package that records the ceremony, the confetti shots, and the family shots, and then employ amateurs to record the remainder of the day. This is similar with entertainment. Look into bands that are relatively new to the entertainment circuit and ask them to play for a lower cost, and promise a reference or testimonial on their website. BUT make sure you hear them play first!!!! And also check they have the necessary things like public liability insurance and all the correct equipment. I know I’m suggesting spreadsheets in every article, but they really do help! Mr M and I have set up spreadsheets to compare venues, photographers, cake bakers etc. By judging each product or service in exactly the same way as it’s rivals, then you can work out which one works with your budget and your taste. The most important spreadsheet you will create. Used to keep track of expenditures throughout your wedding planning. Open the spreadsheet! In the cells across the top (the little boxes) type Expense, Budget, Actual, Variance and Notes(a different box for each word). On Microsoft Spreadsheet, go to the bar at the top that has all the icons on it. Click the little calculator. A box will open with add, subract etc. Click add and then next. There should be a little white box on this page with the word RANGE above it, and a little double arrow icon to the right. Click on the arrow icon. The box will then minimize, and you will see your spreadsheet again. Highlight the BUDGET column from the box underneath the word budget, to the very last expenditure category. For example, if the first category is venue and the last is cake, drag your mouse downwards covering everything between these two categories. But remember, this is on budget column, not the actual words themselves. Once this is done, the box will reappear, and click the next button. This will bring you to the final page, which asks where you would like to see the result of the adding up – which is your total. If you have highlighted it correctly, this should be automatic and you can just click finish (check the row number next to the word total, does it match the number that is in the little white box? If so, its fine). Do this for both the budget and actual columns and then you are ready to start inputting your money! This is a quick snapshot of mine, just to put into perspective what I’ve explained! I have named this the ‘venue spreadsheet’ simply because its an easy topic to start off with. You could use it for anything though, and would be handy for comparing photographers, entertainment etc. I have done this on Microsoft Works Spreadsheet like the budget planner above, but you could in fact do it on a Word document by using a table format. The main idea of this is to be able to easily compare companies or venues by a set criteria. You can then easily pick out which suits your budget. Open the spreadsheet! In the cells across the top, type in the criteria you want to judge each venue by, starting with the name of the venue itself. * time refers to time spent travelling to the venue. I actually chose the three most local towns to me including the one I live in and worked out the time for each. This gives a good indication of travelling times for guests. Use google maps for this. Other criteria could include whether the cost includes capacity for ceremony, wedding breakfast, reception etc, catering, alcohol, decorations, and the aesthetics of the venue. Underneath the venue title list the venues you are considering, and complete the rest of the form with information gathered from the website, brochures or wedding co-ordinator correspondence! Hey presto! You have an easy way to compare your venues! As I said previously, this can be done with anything. For photography, criteria could be whether or not you get copyright of the photos, cost of the package, how many prints are included in the price, and how long they attend your wedding for! Think of all the questions you would need to find answers for and input it into the table!